A new bursary scheme to allow the updating of Irish war dead records was launched in Belgium yesterday by Heather Humpreys, Minister for Arts, Heritage and the Gaeltacht. The scheme, which will begin next year and will run to 2018, will enable Irish students to carry out a World War 1 research project at the Flanders Fields Museum in Ypres, Belgium. As part of the research project, these students will aim to improve knowledge of how many Irish men were killed during the war by examining records held at the Museum, many of which need correcting and cross-checking. Some 49,000 Irish soldiers are included in the Museum's existing digital archive which is based on records gathered in the 1920s and is known to be inaccurate and incomplete. "This scheme will play an important part in connecting young Irish people with the realities of this awful conflict in which so many from the island of Ireland fought and died,” Ms Humpreys said. She also launched a new Google online exhibition on Irish involvement in World War 1. 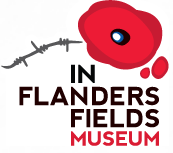 This has been produced by the Flanders Fields Museum and is available on Google’s Cultural Institute.